"After years of design, field trials and customer feedback, John Deere introduces its first-ever 4-track tractor, adding to its extensive line of high horsepower 9R Series wheeled and 9RT Series 2-track tractors. The four new 9RX Tractor models – which range from 470 to 620 engine horsepower – feature a large, robust undercarriage and track system engineered to provide superior power, durability, and improved ride quality, especially when handling large implements in the field. Jerry Griffith, John Deere product marketing manager, 6-9 Family Tractors, says the new 9RX Series Tractors offer customers three distinct advantages compared to similar 4-track models. 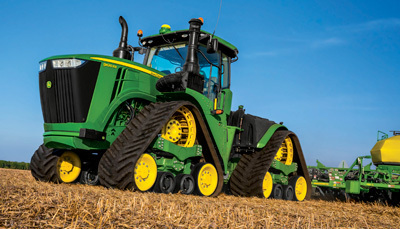 ""The 9RX has a superior undercarriage with a positive-drive track system that effectively delivers power to the ground; it features the outstanding comfort of our CommandView III cab with a new cab suspension system for improved ride quality; and it is designed with integrated performance features already available on our 9 Family of tractors."" These other features include built-in, fully integrated AutoTrac guidance and JDLink Connect information management, the e18 Transmission with Efficiency Manager, and increased hydraulic flow for optimal field performance. ""The 9RX has been designed with our customers in mind to provide the performance, manoeuvrability, comfort and reliability to operate large, heavy equipment under a wide variety of soil conditions and terrain,"" Griffith adds. The 9RX Tractors feature either a John Deere PowerTech PSS 13.5L engine (9470RX and 9520RX models) or Cummins QSX15 engine (9570RX and 9620RX models) to provide the torque and power needed to handle the toughest field conditions. The engine powers a large diameter drive sprocket and drive lugs that, along with optimally placed idlers and mid-rollers work to deliver exceptional horsepower to the ground with less track slippage. The tractors are equipped with rugged, puncture-resistant Camso Duradrive 3500 and Camso Duradrive 6500 (with Durabuilt technology) rubber tracks for optimal load-bearing performance in the field. The track belts are designed for increased life and durability, and are available in 30-inch and 36-inch widths. Like its 9R/9RT siblings, the new 4-track tractors are available with the responsive, smooth-shifting e18 Transmission with Efficiency Manager for automated control of the engine and transmission. This industry-leading transmission responds quickly and automatically in the field for improved performance and increased fuel savings. 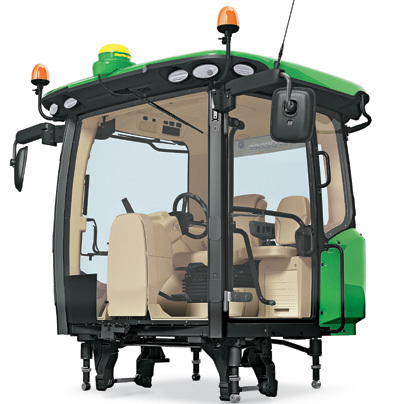 The tractors also feature an articulated steering system and the optional Active Command Steering™ (ACS), which improves manoeuvrability in the field and line-holding ability at transport speeds. 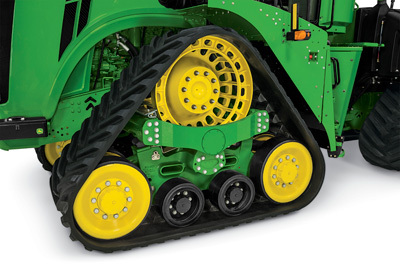 For improved ride quality, the 9RX tractors are designed with a mechanical Parallel Plane Four-Bar Linkage system with 4 inches of vertical travel. This helps to control movement and isolates the cab and operator from sudden impacts and vibration. The intuitive, easy-to-use Generation 4 CommandCenter with custom-built pages and green-on-green integrated technologies provides fingertip control of tractor and implement functions. ""We've also redesigned the hydraulic system in the new 9RX, which includes up to eight SCVs and delivers a standard 58 gallons per minute of flow, or an optional 115 gallons per minute of flow. It easily meets the speed and high hydraulic power demands of the large implements our customers often use in the field,"" Griffith says. ""The 9RX brings to the market John Deere's 20 years of track-tractor expertise and field knowledge gained from our popular 8RT and 9RT tractors,"" he adds. ""Customers tell us the 9RX has the most comfortable ride, is easier to manoeuvre in the field, is easier to maintain and service, and more importantly, provides the power they need to get field work done faster and more effectively."